When I read about the first Habitat for Humanity home being built in Big Lake, I knew it would be an opportunity for community service. 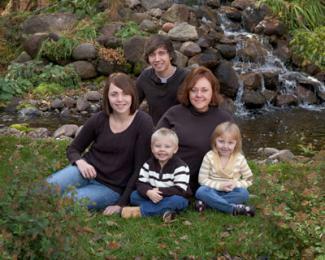 So I offered to create a family portrait for Pam Jenson and her family this fall. When I showed Pam the 24x30 framed print just before today's new home dedication ceremony, she was thrilled. "I've always wanted a family portrait, but didn't think I could ever afford it," she said. Pam and her family were displaced from their Elk River apartment last year when the building was heavily damaged by fire, smoke and water. It's comforting to know their beautiful new Big Lake home will provide some stability for Pam and her four children. I learned that Pam is not only a devoted mother, but committed to persevere in the face of adversity and teach her children the value of volunteer service to others. To learn more about Pam and her family's new home, watch for stories next week in the West Sherburne Tribune and the Elk River Star News.